What you are reading right now is my 250th blog post. Can you believe it? I’m not sure I can. I started writing Tales of a Stitcher in December 2012 and two-and-a-half- years later, I am still stitching and writing. I want to thank all of you for taking this journey with me. I’ve shared my life in Alaska both in the studio and out with you readers. It has been a amazing experience. Who knows what the next 250th blog posts will be about, but no matter what, I am glad very grateful for you dear readers. In celebration, I wanted to give you a special thank you, but what? I finally decided that YES, I was crazy enough to do another mailing. Why stop with the oven mitts? Recently, I was teaching Artful Machine Quilting at the Quilt Zone, and I realized I could send all of you the handout I created for that class. How do you get the handout that shares all I know about machine quilting? Well, you post a feedback comment for me right here. I am interested in what keeps you reading this blog, and how I can do a better job of sharing my world of stitching with you. So, please give me a shout. Tell me what you like, what you would want more of, and even what you could do without. In return, I will mail you the secrets of my machine quilting. Okay, in full disclosure the quilting shown in this post was done with my long arm quilting machine. These handouts are for quilting on a DOMESTIC machine. That said, I started out on a domestic machine, and the hand outs are based on that experience. Here’s to another 250th blog posts! THANK YOU dear readers for going along for the ride. 24 Apr	This entry was published on April 24, 2015 at 8:46 AM. It’s filed under About Teaching, News And Events, Quilt Stories, Uncategorized and tagged 250th Blog Post, Artful Machine Quilting, Tales of a Stitcher Reader Thank you. Bookmark the permalink. Follow any comments here with the RSS feed for this post. I enjoy reading your blog to see what you are up to and I wonder how you get sooooo much done! I love that you have abstract/artsy things as well as more traditional stuff too. And the pictures of the quilting designs is always inspiring. Keep up the great work! Your story of creating a quilt with the residents of Moore House was very inspiring. Just bringing their sewing skills to an appropriate level in two months is amazing, but the artfulness of the quilt is what is truly mind blowing! You are so generous to share more of your expertise. Your oven mitt pattern is getting a good workout. I would also be interested in your machine quilting tips. Gail- I’m glad the mitt making is going well. Maybe the quilting notes will add some new techniques to your work.I hope so! Congratulations! 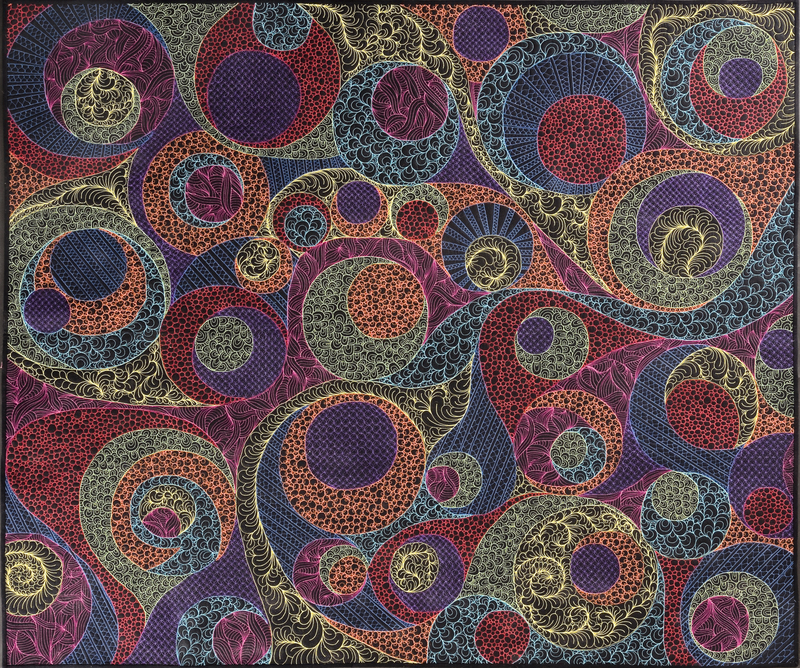 Amazingly, I just came to your blog to look for some more ideas for machine quilting motifs. I have always loved your machine quilting and would love to get the tips. I can just pick it up next week! Looking forward to seeing you! The notes are the mail. See you this weekend! It has been great to get to know you here and in person! Thank you! I finally opened the mail today. it’s been so hectic since getting back Sunday night. I had a great time at the conference. I just posted about the conference today on my blog. Hope you had fun in Portland! Oh, and I would love to get the SAQA notes emailed to me. Thanks! I hope the notes help Kristin, although I truly believe you know what you are doing. It was great to see you again! Congratulations! I am so impressed with the #250, as I am just working on creating a blog of my own. Your blog is one of a few that I follow regularly, and I love the variety of topics that you include in your posts. I’ve been in awe of your machine quilting and all those meticulous thread changes. It is very generous of you to share your tips! (I’ve submitted your name as a possible instructor for a future workshop to our guild’s program committee, too.) Looking forward to future posts. Thank you Marla! I would love to teach for your quild. Traveling and teaching is a new adventure for me that I am really loving. I hope you can use the quilting notes! Congratulations on your 250th post, Maria! I met you in the SAQA area at Houston last November. I am blown away by your work!! Lynn- We have a date for this year’s show too! I am looking forward to seeing both you and Heidi again. I hope you find my quilting notes helpful. Hi Maria! congratulations on 250 posts. I’d love to read your quilting secrets. Kathy- Gosh. I would be honored to send you my humble quilting notes. I would certainly be interested to find out if I say anything new. Thank you for reading my blog! I really love your colour use. 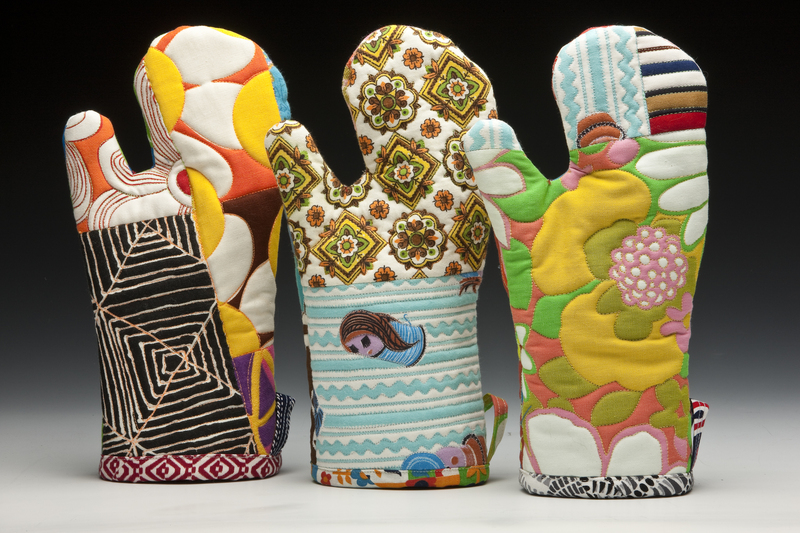 I am fairly new to your blog and thought your oven mitts where pretty special. I am just starting to do more free motion quilting on my domestic machine so would love to read your tips on being successful. Thank you Bev! I’m glad you found my blog and I am happy to send you my notes.I hope they are helpful. Many years ago at MQS I gave a quilt machine stitched by you a Judges Recognition ribbon. It had graphic lightning bolt style quilting on it. It has been a pleasure to watch you grow as an artist! Doris! Oh my. That was a moment I will always treasure. Some awards are particularly dear and that is one of them. Thank you! For reading reading my blog and for giving my FIRST ribbon at a major show. It was a huge boost to my confidence as a quilter. I’m going to have to write a blog post about it! Hi Maria, My favorite posts were 1) your descriptions (and photos) of the Nancy Crow classes you took and 2) the detailed instructions you gave for cutting solids to make stripes with your distinctive, slightly wobbly line. That’s what gives your quilts their unique appearance and makes it possible for me to pick out your entries in a large show. And your oven mitts, of course, are wonderful. They look like a pack of eccentric relatives having a group picture taken–each one stands out, but they all have a family resemblance. Pam- Thank you! You are right about the post on making stripes out of solids. I need to write the rest of them. Maybe in my sleep. I am so glad you found my blog and that our friendship came from this encounter! Congratulations, Maria. I follow your blog because of your original quilts, you share clear photos of your work (rather than “sneak peeks”) and you share some of your processes. I look forward to meeting you next year. Ann- Thank you very much for those comments. I try to be as open about my work as possible and thank you for noticing that. I’ll be sending you quilting notes shortly! Two Hundred and Fifty Bog posts and I think have read every one and many several times… you are such a huge inspiration! Not only the stories and the photos, but yes -THE QUILTING. Your quilts have evolved over the years and they take on new life as you work your magic on the machine. I have seen five or six of your award winning quilts at Exhibitions and they never cease to amaze me. Such detail -and the quilting designs enhance the patterns in the front piecing. Love the colour, the variety of fabric you create with strip pieced elements. Creating your own cloth from bits and pieces and then expanding on each design to create stunning art works because of the stitched elements. Can you tell that I love the stitching? I also love the knitting, the magical clothing you make and model, the inspiration of you living there in Anchorage and at the Cabin next door to Barb? Not near fabric shoppes, or classes easily accessed. The retreats and the Crow Barn adventures…We all love to watch you grow and make your mark on not only the quilt but Fine Art world. Don’t stop now…I’ll be watching. Bethany- You always write the best things. I think one of your callings in life is to be an inspirational writer! Your comments always make me feel so good. The quilting notes are in the mail! Thank you! Oh Maria, I love your posts, and always look forward to them. I’d be so happy to learn from you about your machine quilting.”.so please send any materials my way! All the best Sue Walen…..email above, and drop me a line if you need snail mail address. Thank you, old pal! Sue! It is always good to hear from you.I doubt I have anything new to share with you about quilting,but I am dropping the notes in the mail for you. Gosh, it would be great to see you in person again. Congratulations on reaching 250 posts! I look forward to the next 250. I love your quilts and am happy to read as much about them as you want to share. And your life in Alaska is very interesting. Thank you! 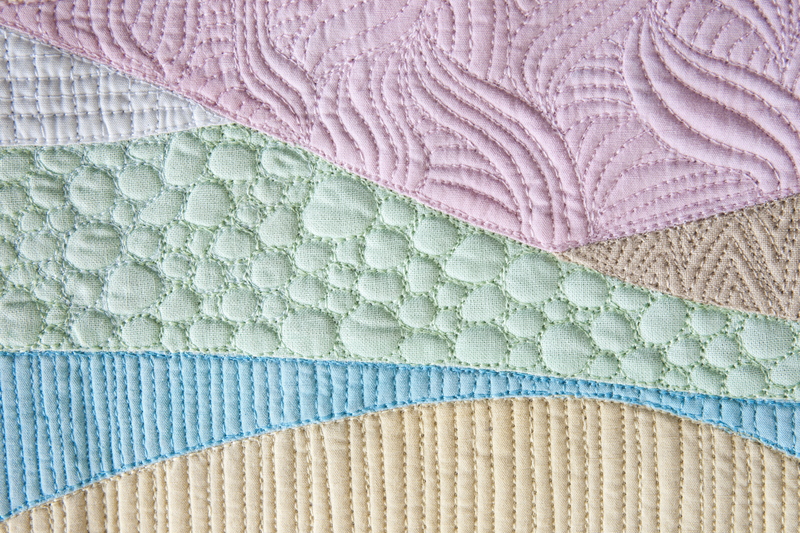 I’m glad you get something from my blog and I hope you enjoy the quilting notes. I love to see what you are up to in the world of quilting, but also enjoy your posts of clothing. All that and I have an affinity for Alaska. I could never survive the darkness of your winters, but I love reading about Alaska life in your blog, especially McCarthy. Thanks! I enjoy your blog! Diane- It sounds like you need to come up for a visit in the summer. You could take my SEW FUN class and get your quilting and AK fix all at once. Thank you for reading my blog! Love it! Congrats on your ‘anniversary’! We love reading about what you are doing and making. I am trying to get better at machine quilting and will take all of the help I can get! Thank you Jane! I hope you can use the quilting notes for your oven mitts. I’m mailing them now. I found your blog while looking for snippets of info on Nancy Crow workshops. It was great to read about your experience with the class. I especially like how you talked about working through the designs. I’ve seen your work in person, and its amazing. I’d love to hear more about how you work through design decisions, especially as you add the quilting. Thanks for sharing! Debbie–thank you so much! Great comments. I hope you can use the quilting notes. Congratulations on your 250th post. Please keep on posting what you have been for the next 250. I love all of it. Thank you Lesley. I really do appreciate you reading and commenting on my blog. Oh Nysha. Thank you. Kaci and I are going to send you a selfie this week while I am in Portland. I know you don’t need help with your quilting, but I am sending you my notes anyway. Wow! I enjoy hearing about life for a quilter in Alaska. Here in sunny New Mexico can be very different and the sometimes very much the same. 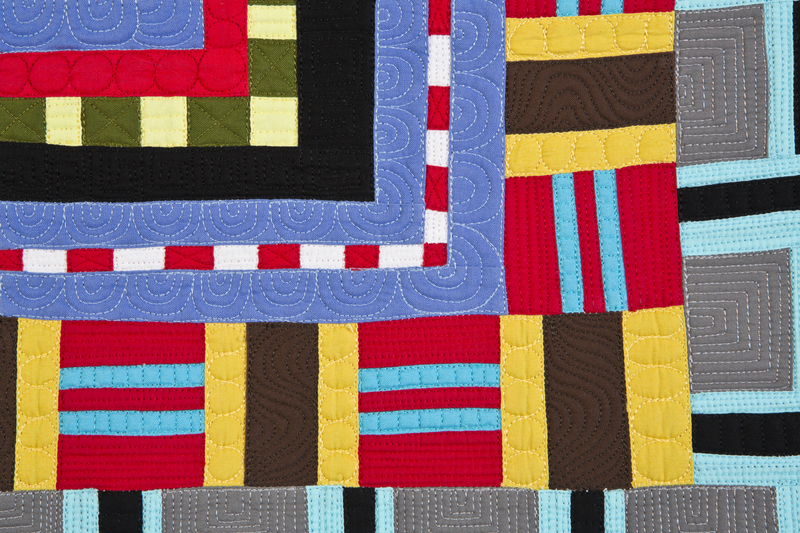 Your quilts are so beautiful are enjoy hearing about the community quilting you help with too. Thanks for sharing a piece of your life with us! Thank you Colleen! I hope you find my quilting notes helpful! I have found everything you have posted quite interesting. I am fairly new to your blog and am slowly working my way back through your posts so I don’t have any favourites yet, I like everything 🙂 I love your machine quilting which I find very inspiring as I am just starting my machine quilting journey. Thank you Pip! I hope you find my quilting notes helpful. Your photography is superb and I look forward to every colorful post. Keep ’em coming is all I can say. Congratulations on your blog! I love following your quilt journey and all your great pictures! Heidi! It is so good to hear from you. I hope your travels were good. We need to chat. Thank you for the good words about my blog. I am so glad you are a quilt lover! They say one picture is worth a thousand words-And I find it true when looking at pictures of your machine quilting-you’ve provided endless inspiration with all the motifs in your samples/quilts. As a recent follower, I enjoy seeing all your projects, knitting and quilting. If you were to talk about dyeing your own fabrics I admit that I most likely would skip over that but I’d like to hear about how you piece your quilts. And I love your oven mitts ( you already know that though). I have a long arm but still want to become a more proficient quilter on my domestic machine. I’ve enrolled in a couple of online classes focused on domestic machine quilting but more info would be a good thing, non? If you are willing to share I would love to have a copy of your materials! Congratulations on your 250th post! Thank you Stephanie! I hope to write some more about quilting on the domestic machine here on this blog. In the meantime, I will send you my notes! I’ve only found your blog recently – and I’m a regular lurker now. I love process and understanding the how and why. I read posts as opposed to skimming – so I care about the words and ideas. Of course, I also enjoy the photos. I would be delighted to learn more about domestic machine quilting – it is something I want to devote more time to in the coming months. Thank you and congratulations on your milestone! Thank you Julie! I hope to do exactly that–write some posts that fill the gaps on the handouts I am sending you. I hope you will enjoy them AND giv eme feedback if necessary. I am glad you found my blog! I like the variety of things you present for our enjoyment, so I’m not going to be much help in deciding how to improve! I started following your blog after being at the Barn with my friend Colleen K.
Dianne- I’m glad Colleen convinced you to stop by. Thank you! I’m glad you like the variety. Sometimes, I think it seems weird, but it is me, so I do it. 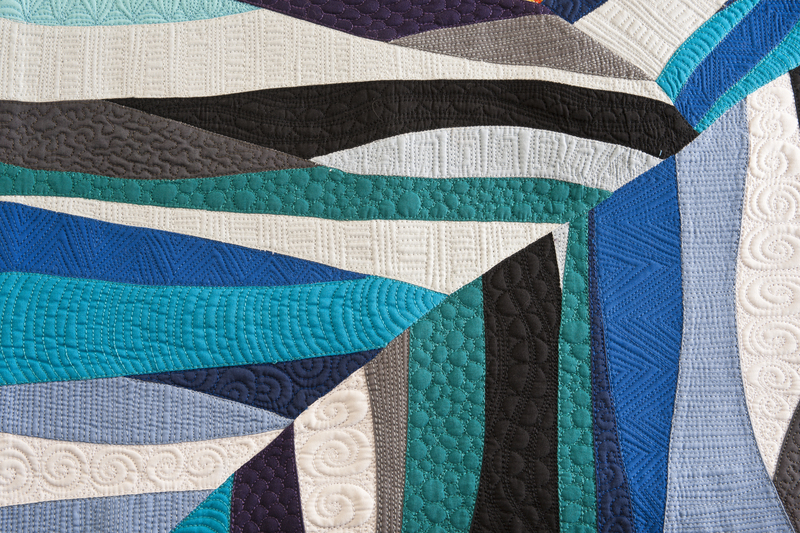 Until fairly recently, I never thought of myself as a quilter. I sewed, I embroidered, I embellished, but, no, I didn’t quilt. And then one day I realized that I was, embraced it and realized the limitations I’d been placing on myself by avoiding that idea. I’ve become obsessed with the possibilities of machine quilting, and am looking forward to learning as much as I can. Emmy- I know what you mean! Some times we get really stuck as identifying ourselves in certain ways. I was never a knitter, and now I can’t believe I thought that. Of course, I’m knitter! Thank you so much for stopping by and commenting. Congratulations on writing a very interesting and entertaining blog. Just keep doing what you’ve been doing, it’s great. Thank you Linda! I’ll be sending you my quilting notes here shortly. It is always good to hear from you! I am impressed with the many quilters I’ve met from Alaska. There must be something in the air (beside Siberian smoke) that keeps you all inspired. I’ve been tackling more on my domestic machine after I discovered it has directional sewing, no more fighting with turning and rolling and flipping on the straight line quilting. I’m always interested in new techniques and motifs . Thanks! Thank you Martha! There are a lot of quilters, gardeners, and knitters up here in Alaska. We like to keep busy. I really appreciate you stopping by and commenting. I know you are getting on the George machine and making beautiful stitches. Still I will send you my humble notes. Thank you Colleen. It is always good to hear from you! I love following your blog for your beautiful original quilts, your humble discussion of your process, your sense of humour and your outlook on community. Following is another way to share in that sense of community. Congrats on so many posts and it’ll be fantastic to glean some more of your quilting techniques and ideas!! I think I originally found you by looking for something on Nancy Crow? Thank you for the great comments. It means a lot to me. YES. I’ve written about my wild ride with Nancy. In fact, I’m getting ready for two more weeks of study! Thanks for stopping by. That was me above had a bit of trouble commenting from my reader, It was weird once I scrolled past the first two comments all the rest disappeared except the emoticons hanging in mid air the comment box was there but not the button to post. don’t know why when I went to the web browser it worked but I was logged in as a user on a private blog-so all a bit weird this is my normal log in!! Camilla- I don’t see the weirdness, WordPress must of fixed it. Thank you for stopping by! I love your blog because you give so much insight into your creative process as well as your life. Your blog is a joy to read because it is so well done; professional-level content and images loaded with Maria Shell personality! Your forays into apparel sewing and knitting have been fun to follow as well. Congrats, and best wishes for the next 250!! Justine- Thank you so much for saying those things. I hope you can use the quilting info to make your oven mitts! Congratulations on your 250th post! That is impressive. I have come across many blogs and website from other artists/quilters and have often clicked to receive the posts or newsletters. Then I usually find that the content doesn’t speak to me, and I feel overwhelmed with too much in my mailbox and I unsubscribe. But your posts always peak my interests on a Monday am. I love your brilliant use of color and modern design aesthetic. It’s been interesting watching your work develop and grow. I especially enjoy learning about your community work and the techniques you incorporate into your pieces. Please continue to share how you do it all. Elaine- Thank you for the really lovely comments. It means a lot to me–it really keeps me going! Thank you. Thank you Ann! It is great to have you as a reader. Congratulations on sustaining a wonderful blog. Many can start; few can sustain…. I love your enthusiastic exploration of new media and techniques–your obsession with knitting patterns; your determination to make your own clothes for a month. But mostly I love your willingness to share a glimpse of your daily life as an artist. Thank you Lee for your generous comments. I take them as high compliments coming from you! Congratulations on the 250th post! I would very much like to have your machine quilting handout. It’s a skill I’d like to learn, but I have never made time enough to sit down and learn, and then practice. I always hand-quilted, because that was what I knew. I’ve been thinking about what I should write. I really enjoy seeing your process – I too very much enjoyed the Nancy Crow class descriptions. But I also am interested in your day-to-day, like the pictures of your studio (before and after), your machine quiting, the grid piecing. The number of hours it took you do to all that mailing prep for the gallery shows was fascinating, as I have an unfortunate tendency to underestimate just how long that binding is going to take (extend the metaphor for just about everything I do. sigh). But I like your moose and flower and McCarthy cabin posts too because it makes you human, not some art-producing machine. I’m not being very helpful. Thanks for writing your blog. I find it almost always interesting and inspiring. Congratulations on the 250th Post… I came across your blog when you were at McColl Center for the Arts. I am intrigued by your style, and impressed by your “Community” work. Would enjoy hearing more about that process and all that goes with it. Am just learning to FMQ on my domestic machine so would greatly appreciate any tips and tricks you can pass along. Love your use of color and pattern! Thank you Kat. There is going to be LOTS of McColl Center blog posts coming up soon. The next project on the list is the community quilt for Moore Place. I’ve got it all in my head, now it needs to get under the sewing machine. Thank you for reading my blog! I just love to read and keep in touch. Thank you Ana! I hope your long arm schooling is going well! Thank you Ana! I hope your long arm quilting is going good! Congratulations! I just found your blog and have spent an hour or so reading your lovely posts. You may have covered this in previous posts but I’d love to know how you begin a quilt design and why you choose certain colors as well as information on quilting designs. Thank you Monique! That is a good question. I know you can go to my ABOUT page and search for particular topics and get to older posts that way. And at the bottom of each post there should be links to other posts that are similar. I hope this helps. Thank you Jackie! I am glad to hear you are doing the work. Maria, I love reading your blog because of the mash up of Alaskan life as well as your passion for your art. Congratulations on 250th! 25 is the silver anniversary…not sure what is appropriate for 250! Keep doing what you are doing because it works…. Thank you Carole! It feels good to have you as reader! How nice of you to share the handouts from your class with your readers. Thank-you very much. I personally like reading blogs that have a mix of personal and technical info. It helps me connect to the blogger on multiple levels. Congratulations on your 250th, post and here’s to the next 250. Diane- I hope you find the notes useful. I agree–getting to know the blogger as a person is a must for me. We all connect to narrative. Thank you for joining me on this journey! Diane- for the life of me, I can’t seem to send you an email. It keeps bouncing back. If you send me an email with your mailing address included in the email, I will send you my quilting notes. I apologize for the confusion. Thank you! I am a SAQA member and heard about your inspiring presentation at the SAQA conference, though I was not in attendance. I would like to know how you keep track of your entries. 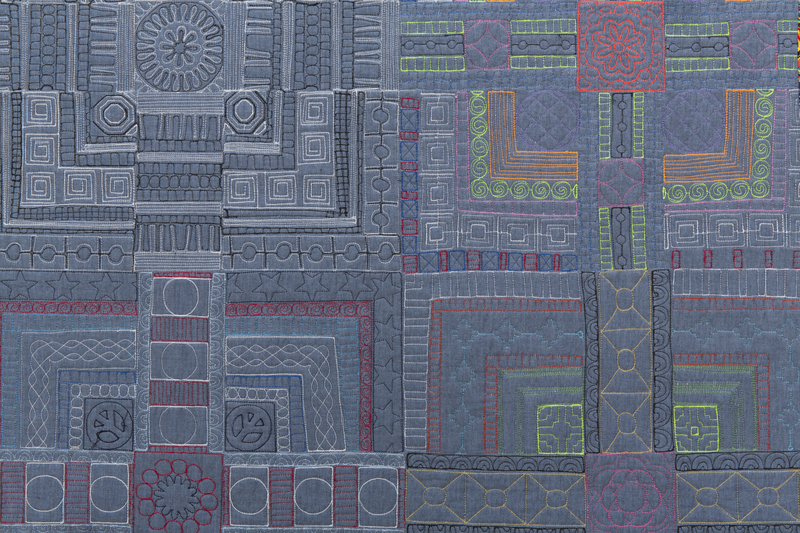 I am a fiber artist as well and I would love to hear your secrects of machine quilting. Thank you. Pat- I am getting my hair done today–it needs it. And after that, I will be working on a blog version of the speech, so stay tuned. I’ve got lots of notes for you that hopefully you will find inspiring. Thank you stopping by and commenting. It is always good to hear from fellow SAQA members. “No time like the present” to discover your interesting blog, a great combination of ideas, techniques and patterns. Your variety of stitching patterns are of particular interest right now because my the design I’m playing with has multiple stitching opportunities. If your secrets to machine quilting is still available I’d love to have a copy. And thanks for making your SAQA Conference talk available via webinar. Would have loved to be there in person. Thank you Sheilana! I would love to send you my machine quilt notes. I will email you for your address. Thank you for stopping by! Hope I’m not too late to obtain your machine quilting info. I have only a, well, actually three domestic machines and have been promising myself that this was the year to start teaching myself machine quilting – for several years now. I’m catching up on blog posts while camping with my husband in southern Ohio – the location chosen so that I could visit the 19th annual Quilt National show – and congratulations – your entry is wonderful and makes me smile. I particularly like the kinship it reflects between art and traditional quilters. Enjoy your blog. Followed some your tutorials on lines, slicing fabric as pattern components and re-piecing to make new fabric. I feel like I am in art school again 🙂 Lovely! Now am interested in tackling domestic fmq with my straightline machine. Your tips in other areas are comprehensive, I bet your tips on this subject are too!bIf younare still offering them. I read a lot of your articles out of sequence and time (eek). Nice find on the low energy ironing machine too.I suspect that will be my next purchase. Read your solar posts just in time. Was going to venture into pedal powered machine to reduce energy consumption. Will start with the iron. I am glad you are finding the posts helpful. I will send you an email with info about my quilting notes. Take care! Maria, I’m a couple of years late to this blog post, but I’m here because I’m thoroughly enjoying your book right now. l’d love to know more about your distinctive approach to machine quilting. Thanks for all the inspiration and technical know-how in your book – it’s excellent!